Auto Clicker is the best software for windows users. This latest Auto clicker software automatically clicking a left mouse button with a keyboard shortcut. Download and install this latest Auto clicker and allow the latest software for mouse clicking and give your fingers some rest. 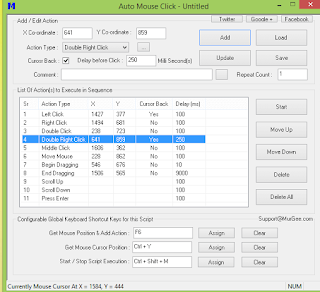 The main window of Auto Clicker allows configuring various options for the Auto Clicker. You can configure delay or interval between mouse clicks, can define the number of mouse clicks to be automated, a keyboard Shortcut Key to Start / Stop Mouse Clicking automatically. Auto Clicker also allows configuring Interval / Delay in Mouse Clicks in values of MilliSeconds, Seconds and Minutes. Apart from the configurable option, Auto Clicker also shows the number of Mouse Clicks automated. The Auto Clicker Software Download is offered on a free to try basis. You can try it for free for up to a few months and after that you must register your copy to keep on using the Software. Set the number of times to click or unlimited. Choose between which mouse button to click as. Pick between single clicking, double-clicking or triple-clicking. Convenient - Hotkeys work while the application is in the background. Settings are saved (includes last fixed location). No advertisements or malware for users. Here we share some simple and easy steps to use Auto Clicker. So follow the instructions for use Auto Clicker. Download and Install Auto Clicker at the given link. Launch Auto Clicker with Shortcut on Desktop or from Programs Menu. Notice the System Tray now, which will be having a new icon in red color with Icon of Auto Clicker. Double Click the Tray Icon or Right Click on the Tray Icon to Show the Main Window of the Auto Clicker. The Main Window of the Software allows you to configure the shortcut key to start/stop the mouse clicking automatically. You can also define the interval between Mouse Clicks and number of Automatic Mouse Clicks in the main window. Let's create a Shortcut Key to Start and Stop the Auto Mouse Clicking, press any keyboard Key which you would like to use in the white colored edit box provided and click on Assign. In this How to Auto Clicker, let's use Ctrl + E as the Shortcut Key for Starting and Stopping the Auto Clicker. Now Hide the Auto Clicker Window by either clicking on the Cross button on the top right or click the Hide to System Tray Button. Now Move the Mouse Cursor where you would like to click the mouse automatically and press the Shortcut Key (Ctrl + E in this How to). Press the Shortcut Key again to stop the Auto Clicker. 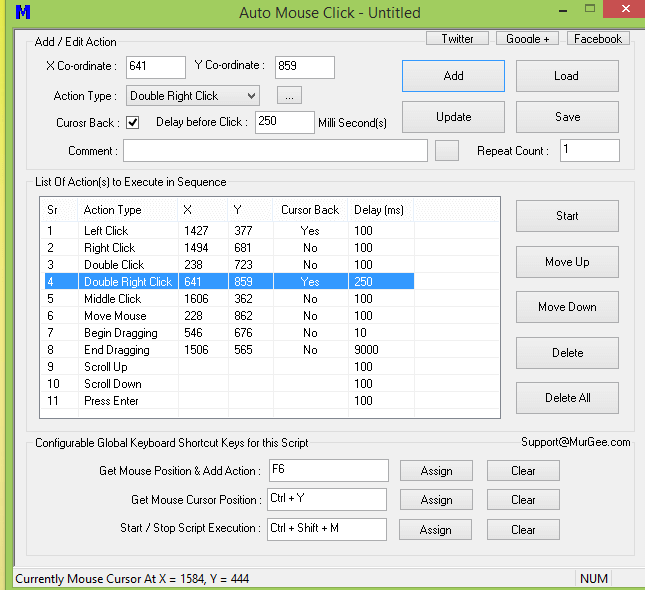 Auto clicker software latest makes the process of clicking mouse cursor automatically more easy and helpful for windows users. So download and install this latest software for your computer windows. This latest software support all windows XP, 7, 8, 8.1 and Windows 10. If you wish to download and install this latest Auto Clicker for windows, then click the given link for free download. Just tap the link and your Auto clicker download start within seconds.